Scientific Background: The multifunctional, multi -compartmental protein Calreticulin (Crt) functions as a soluble molecular chaperone of new or misfolded proteins, as well as a Ca2+-binding protein. Most abundant in the ER lumen, Crt expression also occurs in other membrane-bound organelles, the cell surface, and extracellularly. Also known as CRP-55, calregulin and HACBP (high affinity calcium-binding protein), Crt contains the ER-retrieval sequence, KDEL, and is the solub le paralog of the ER membrane protein Calnexin (Cnx). Crt's three domains include a 180 residue N-terminal domain, a proline-rich P domain residues 189 -288) that binds Ca2+ with high affinity and shares homology with Cnx and calmegin, and a 110 residue C-terminal domain that binds Ca2+ with low affinity but high capacity. The P-domain may interact with the co-chaperone ERp57 (Grp58), a thiol reductase. The NMR structure of the P -domain consists of an extended hairpin that appears to form a curved protrusion from the Crt core domain. Both Crt and its membrane bound homolog CNX interact with proteins and glycoproteins possessing monoglucosylated N -glycans. The Crt/Cnx cycle promotes correct folding, inhibits aggregation of folding intermediates, blocks premature oligomerization, regulates ER degradation, and prevents incompletely folded glycoproteins from exiting to the Golgi complex. Crt also appears to function as an auto-antigen in systemic lupus erythematosus, rheumatoid arthritis, celiac disease, complete congenital heart block, and halothane hepatitis. A diversity of additional functions attributed to Crt includes adhesion, blood function, and cardiac and neuronal development gene expression. 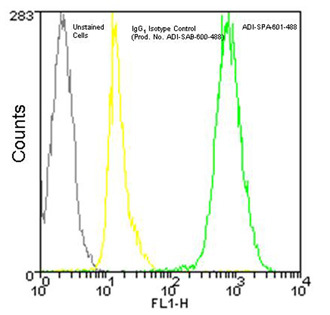 Flow Cytometry Analysis: 106 Jurkat cells stained using Calreticulin Monoclonal Antibody (FMC 75), DyLightTM 488 Conjugate at a concentration of 50 μg/mL.